Charge drill driver, and how to use it. When carrying out Sunday carpentry by DIY, charge drill driver is not necessarily required. However, if charge drill driver has, the efficiency of work increases and it is convenient. 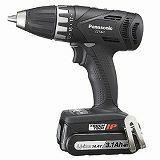 This photograph is charge drill driver of Panasonic. Charge drill driver is only a rotational function of a bit fundamentally. As for the latest thing, it is common that revolving speed can be adjusted without going through stages. Charge drill driver's function is used to tighten a screw, to loosen or making the prepared hole of a screw on woodwork. Moreover, if the strength of a clutch is adjusted, it can prevent tightening a screw too much. On woodwork, many course thread screws may be used, and if charge drill driver is used in that case, the efficiency of work will become very good. Charge drill driver often uses for mainly tightening a screw, loosening or making the prepared hole of a screw on woodwork. There is an advantage which can be used even if it does not connect the AC code, since it is rechargeable. The mechanism which detaches and attaches the bit of a drill has a system which tightens the screw of a bit, and a one-touch attachment-and-detachment type. Although a one-touch attachment-and-detachment type is convenient, a bit requires a thing for exclusive use. When the bit of a drill is small, there is a thing of an attachment-and-detachment type, but since there is nothing of an attachment-and-detachment type when it is a bit of large size, it is necessary to use an ordinary bit. In cheap charge drill driver, since the parts with a bundle of the bit are options, it is careful. The charge time of a battery, torque, the maximum puncturing capability, etc. change with a maker, a model, or prices. Let's choose the model which compared the price with the function and suited the use. Probably, it will be better to choose in consideration of what is used for charge drill driver's battery. There is a thing of a nickel-cadmium battery, a nickel hydoride battery, or a lithium ion battery. The thing of a price of a lithium ion battery is a little high. Since a memory effect does not have weight that it is light and there is little electric discharge, either, the thing of a lithium ion battery lasts long compared with the thing of a nickel-cadmium battery or a nickel hydoride battery. Moreover, the impact driver may be more convenient when using many cases where many work is done continuously, and long screws. It seems that there are generally many small things of power among charge drill driver. It seems that power is insufficient for turning a long course thread screw. In that case, an impact driver is used. Moreover, power shortage may be carried out also making the hole of a large caliber. In that case, an electric drill is used. A battery has many which are using the nickel-cadmium battery or the nickel hydoride battery, and neither self-electric discharge nor a memory effect can be disregarded. Charge capacity may have become less, when using after carrying out prolonged storage of charge drill driver. It may be unable to use, unless it charges before use. Moreover, two or more batteries for charge are required to carry out continuous use. It seems that a price is high although the lithium ion battery is used recently. There is little self-electric discharge and a lithium ion battery does not have a memory effect, either.